You probably know us. We are a group of radio-nerd friends who have launched hyperlocal radio station at 100.7 FM in Ferndale, housed at the Rust Belt Market. We have launched live programming, and we're thrilled! But we still need your support. Your support helped get us on the air. Continued support will help us improve and become a mainstay in this city for years to come. Ferndale Radio delivers local and independent music that can't be heard anywhere else on the dial, along with hyperlocal news, information and discussions. You'll be able to show everyone that you support Ferndale Radio with this sweet sticker. 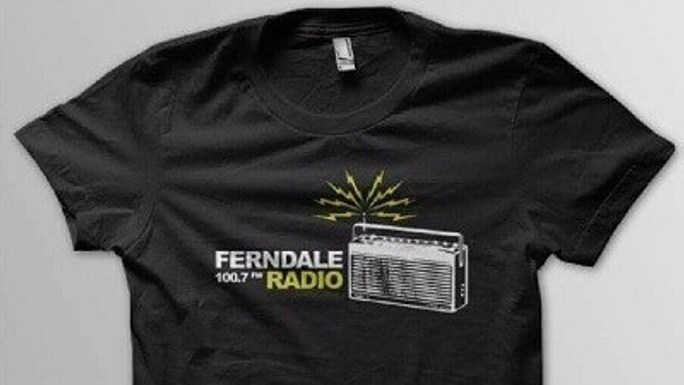 Wear your Ferndale Radio gear with pride in this awesome T-shirt. It's Michigan. It's cold. Stay warm and let the world know that you support local radio.